Back to the topic I'm always die for skincare product!! 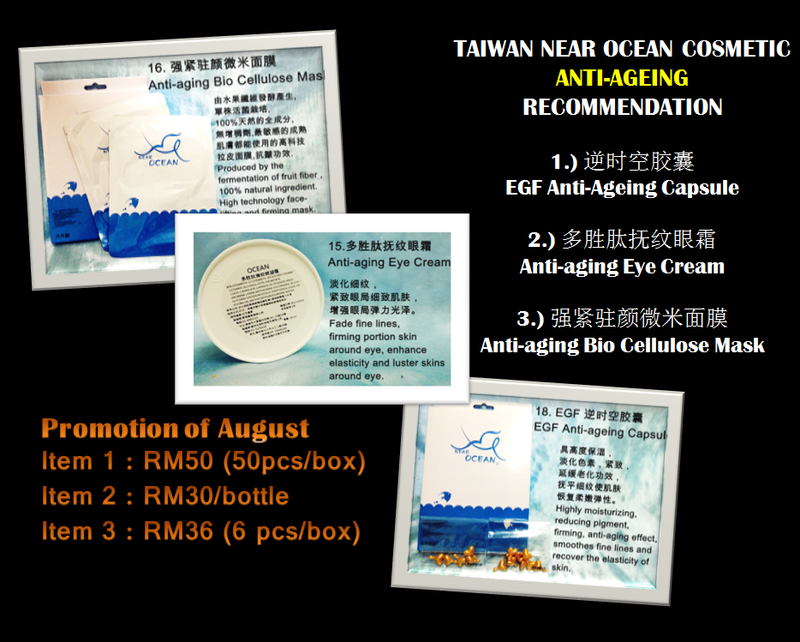 I know you will often saw me purchased new beauty product and doing some review on my blog but have you read my previous blog post about the Taiwan Near Ocean Mask? You can click on♥ http://www.chanwon.com/2013/05/taiwan-near-ocean-mask.html to check it out. I know some of you already purchased and you know what it's CHEAP and NICE!! 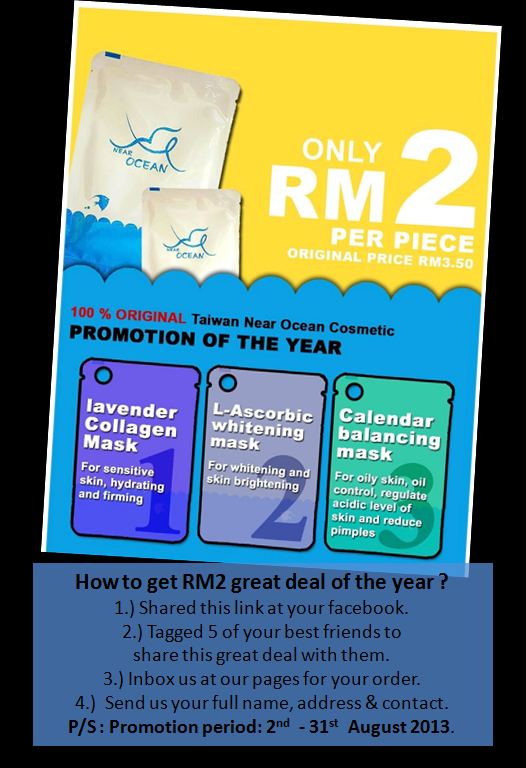 I mean like RM2 for each facial mask is really reasonable and affordable for everyone of us!! Am I right? It's not just cheap the result and outcome after used it is totally OUT OF OUR EXPECTATION!! For those who tried I'm really happy because I keep on sharing this with my friends intro them and recommended them with this mask. 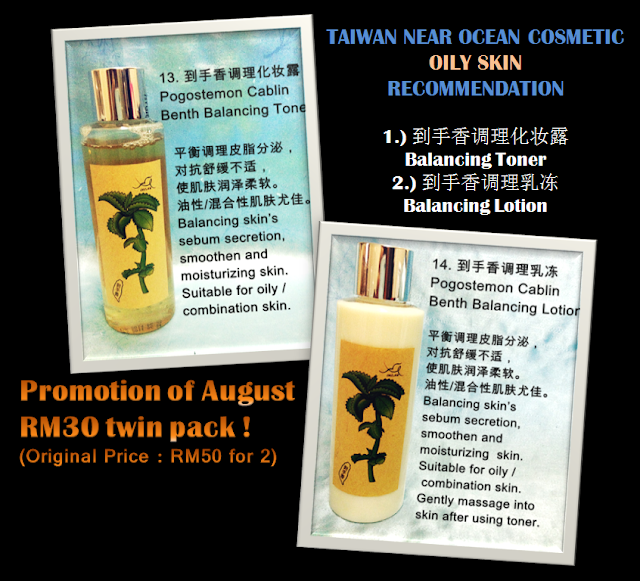 PROMOTION IS ON GOING FROM NOW! I'm not sure you grabbed it or not if not it's time for you to try out their facial mask sheet!! I will place all promotional items and state their price on the bottom of this post So yeah!! Keep reading :) I won't touch so much on their facial mask because I already wrote a full review and blog post about that.You can click here for more :) I love their Whitening & Brightening C mask♥♥ !!! I already order another 20 just for my own!! 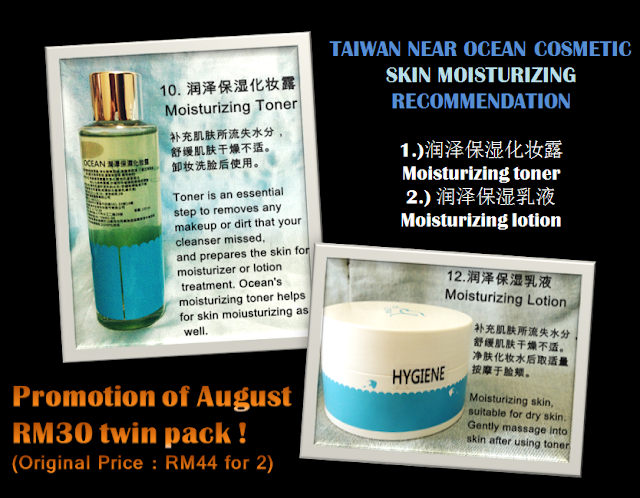 HAHAHAAH I know I'm crazy but did you know that Near Ocean have their special skincare product range too? Have you try it? Oh yea, this is the first item I'm gonna share with all of you! 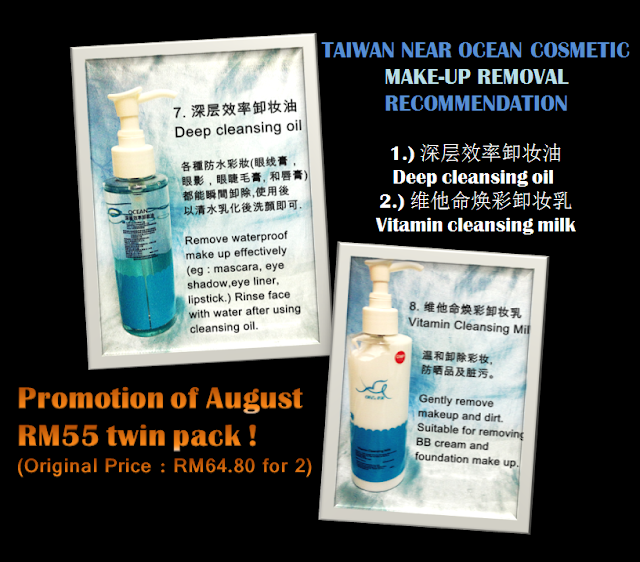 It's makeup remover oil♥ I'm not sure this is the 3rd time or 4th time I recommend this on my facebook and twitter. Finally I have the chance to update a proper blog post about this product. I get this from the beauty fair @KLCC few months ago and I remember during the fair they're doing their promotion this just cost me RM20-RM25 I forgot the price but for me this is DAMN CHEAP. Compare to my previous makeup remover I get from skinfood I can get two bottle of this. I remember the reason why I bought this is because my previous makeup remover already become a blank bottle! Lol I get this because I wish to try something new and also never expect it as good as my previous makeup remover. I swear this is MUCH BETTER THAN THAT♥! They recommended me to use it with a cotton pad but most of the time I will just use my hand to remove all of my makeup if I'm wearing mascara and full makeup on because I don't wanna to waste any additional cotton and I think using both hand is really so easy and convenient to remove all my makeup within just 1-2 mins! The problem when you're using your hand is all removed makeup will stick on your face and your eye area after you remove the mascara and eyeshadow your eyes look like panda :P Then you need to wash it with warm water. 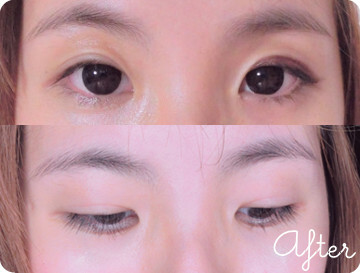 All eyeliner and eyeshadow dropped!If you're using mascara then need additional 30 second and move the cotton pad gently from left to your right side. Then both will have the same result too. See my After Photo too! It's so clean I didn't use others product . I just pour this remover on a cotton pad then use that to remove all my makeup. So clean right?? Next will be another JELLY MASK which is actually a Gel Mask but I prefer to call it ask jelly mask♥♥ lol!! They have 3 diff kind of jelly mask and I think this one is more affordable if compare with other brand. As you know sometime we just prefer something which is big size and more affordable but this is slightly diff from epure jelly mask because this is for whitening one :) Epure mask is best for those who wish to to have a deep moisturizing on their skin but this one is more on brightening. So don't ask me which I prefer because each of the product meet diff needs of people and it's actually depend on you♥♥. If you prefer to have whitening type of jelly mask with affordable price then go ahead with this because this is much cheaper than the others jelly mask. 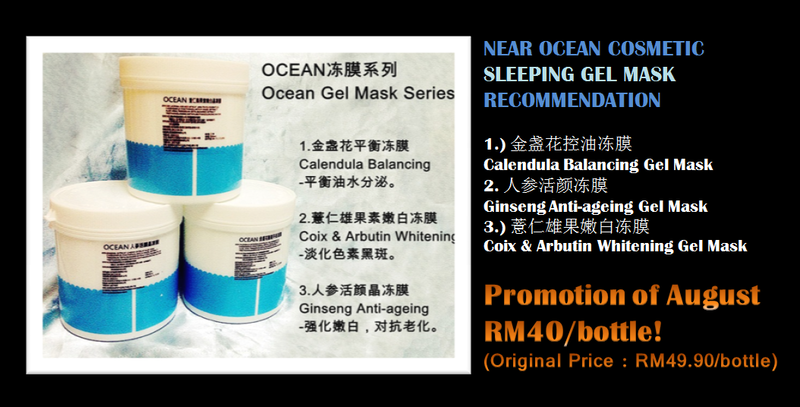 I got myself a whitening Gel Mask but Near Ocean have another 2 which is anti-aging and also balancing gel mask. No need for me to list down which is suitable for you. The balancing one is suitable for those who have oily skin so that you can actually balance your oil level and control it nicely. ♥ One thing I don't like about this gel mask is they didn't provide us any mask spatula for us to use. We need to consider the hygiene level of this so please don't use hand to apply it you should find or get yourself a spatula to apply on your face. Other than that I guess it's pretty much work the same as other jelly mask but in term of whitening I think the result you can obtain and see straight after you wash the face but for me I guess every time you finished your mask and washed it your face will seems to be brighter and it's very normal not because of the magic of jelly mask actually. Like when you apply mask sheet you can instead see your face color tone is slightly lighter but for a long term result I can achieve a smoother baby skin and of course never forgot I can whitening at the same time using this. I don't hope to become whiter but I just hope to maintain my current skin tone so each whitening product I use is just for me to maintain and keep back my current skin tone. ♥ Let me talk about this sleeping mask. This is a little bit sticky for me if compare to others brand :) I'm not sure whether you like it or not but one main reason I can't stick to this sleeping mask is the scent is kind of smelly..Is not smelly actually I smell something like plastic smell I think because they didn't add any fragrance inside and that's why I can smell the plastic thing. I think if you want to use this you have to apply 30 mins before you sleep if not your pillow and your bed will touched your face then everything kenal your sleeping mask already. The absorption level is quite slow as it's quite sticky and because this I strongly recommend you to apply this 30 mins earlier before you sleep ya. 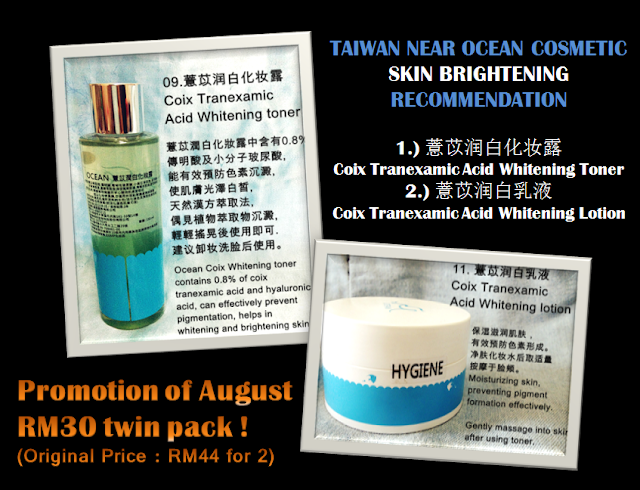 Apply after your toner and gently apply all over your face. Muhahaha I know you wait this for so long!!! :) I know you wanna to grab them home badly :P I love to talk with their page owner which selling this Near Ocean brand because she not just do normal selling only. You can talk to her and tell her what type of skin you have. 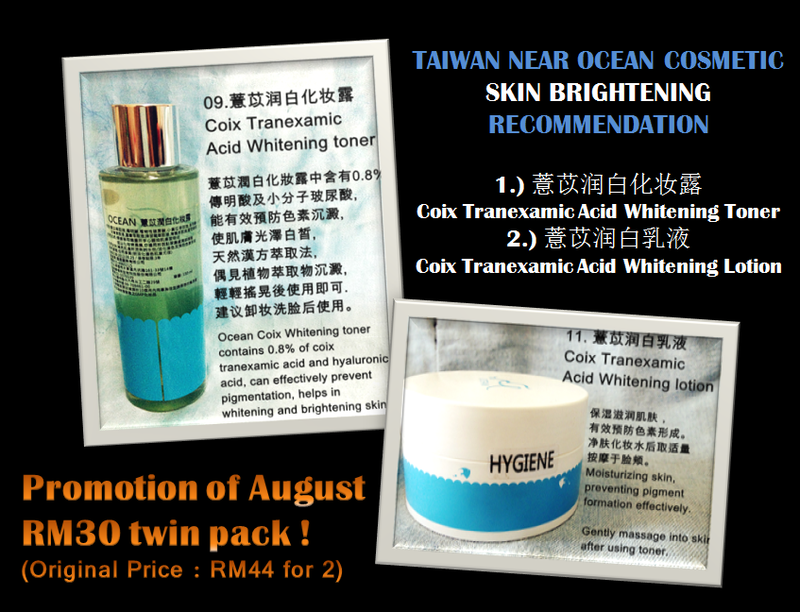 They will recommend you regarding your skin type and of course all lovely promotion from them! Love it so much and it's really special to us! You know la now a simple skincare product also have to cost like more than RM40 and it's really bad if I keep on intro and recommended expensive high-end product and I guess sometime reasonable and affordable brand or skincare product can use to compare with those expensive product. Each product have their pros and cons but it appear on this market is just to meet our customer needs and also not everything exp or cheap is bad or worst :) You just have to get the one you afford to pay with and also GOOD TO USE! This is what I bought during their promotion!! I guess now left 10 pieces only! 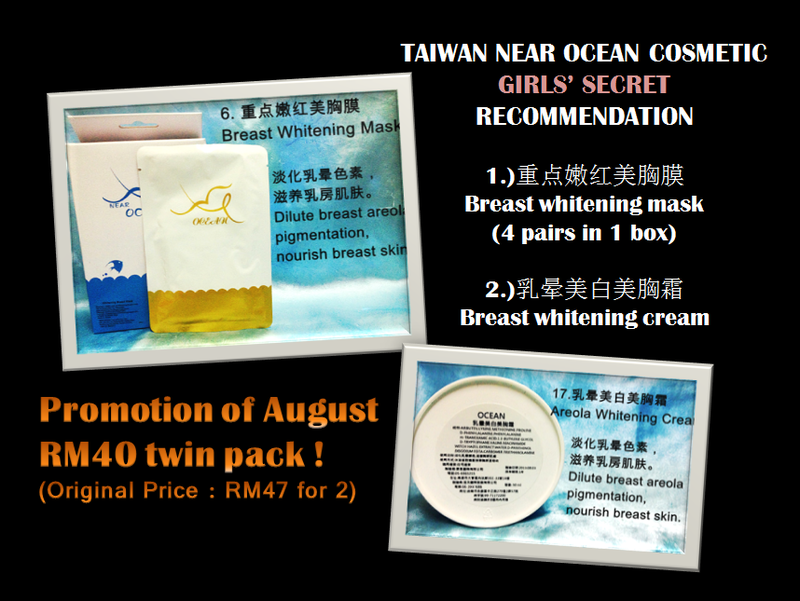 I hope to get their hot selling item their mask for FREE :P But hor RM2 ALREADY SO CHEAP LA.. I also feel very bad if I'm not buy from them because REALLY RM2 SO CHEAP AND THE OUTCOME IS DAMN GOOD LEH!! So If I'm willing to spend that amount and bought it home!! I really strongly recommended you to try out their whitening C mask n the blackhead black king mask which I RECOMMENDED FROM PAST FEW MONTH UNTIL NOW!!! GOOOOOOOOOO N TRY THAT!! !